A lot is being said about the Swatchch Bharat Campaign. But there are few who take up this mission towards our own health. Today I am taking you to meet 32-year-old Nandita Singh from Bengaluru, who is BEING THE CHANGE WE ALL WANT TO SEE. The area near her house in Bengaluru wasn't a garbage pit the way it started becoming a year back. In the last six-eight month she details, they saw huge piles of garbage being dumped in the vicinity. At first they thought it will be cleared up by the city administration, but instead, it kept piling up creating stench. Moreover, the colony kids had become falling sick, some even got Diarrhea and skin allergies. In this situation what do people generally do? They blame the local administration. Instead, let's listen to what Namita did, "We tried to track down the waste Collectors but soon learnt this was a huge scam. Fighting with the local body comes with a risk. You get targeted. So we played safe first by befriending the local authorities and then brought this issue. We had to keep complaining and finally, the garbage was being cleaned. This was the first step." Nandita continues to detail, "The next challenge was the residents, many didn't bother, and some would throw garbage trying to stop us from getting into a different zone. Yet we kept on requesting them not to throw garbage like that in open. Side-by-side we started tracking the Garbage Collector and ensured that he began lifting it from our region. 70% of our sustained efforts through last six months have begun paying off. But, I have to keep it going through the determination of every single like-minded person. This is a collective responsibility." She sounds pretty determined, right? But you will be surprised to know that Nandita was in a different mind-zone all-together till a few years back. And rather than me telling her story, I will let this daughter of a senior lady at the Indian Institute of Science (IISc) and an ex-service father from the Madras Engineering Group...speak about herself. "I was a process associate in finance team at a KPO. Also was pursuing my MBA in HR through correspondence. After 4 years of reaching professional Heights, I got married. I left my job and moved to a new city - Kochi, Kerala. The married life kept me occupied and finding a new job in a new city was quite challenging. 2 years after my marriage my daughter was born and she kept me busy after that. My mother is a working woman so she couldn't be there to help me look after my daughter. And not much of support from in-laws either. So I was on my own raising my daughter and I had no time for myself. Rather, you can say, I had somehow lost my real-self somewhere amid all these responsibilities." She continues in the same breath, "My husband has a job that requires a lot of travel. Since Khushi, my daughter who is six-year-old now, initially could not be left alone. I began sinking into depression. But the worst part was that my depression went unnoticed!" This was six years back she informs. And then she details that once Khushi turned five she gathered her courage again and began hunting for a job. "A gap of 7 years wasn’t helping me. Getting rejected only made matters worse. I knew I was losing my inner willpower. But these rejections somehow taught me one thing - UP-SKILL YOURSELF. And I decided not to go back into depression. Now that Khushi goes to school I had almost 6 hrs for myself. And thus, I decided to upgrade my skills. Through online tutorials, I self-trained myself in HTML and CSS, Wordpress and started writing whatever topic I could think of. 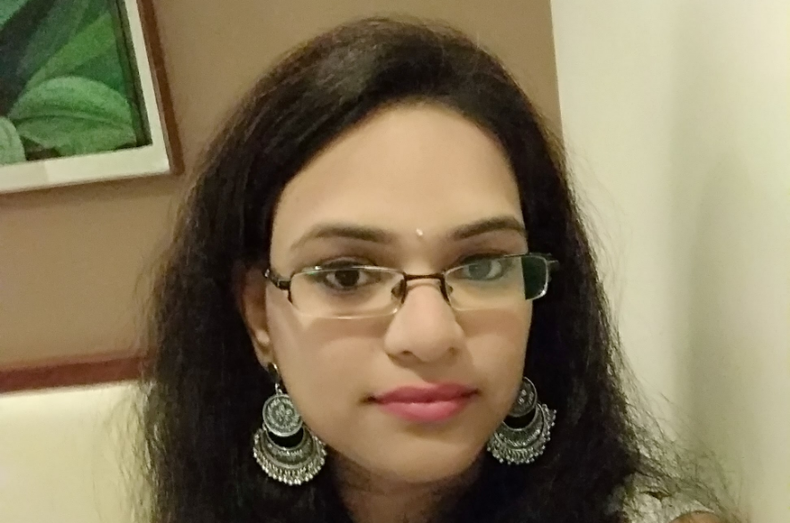 I also started searching for home based jobs, it was then I came across SHEORES," recalls Nandita who is now a very active member of the SHEROES Aspiring Writers Community and Moms of Kids With Disabilities Community. She informs that through SHEROES' Aspiring Writers Community, she would take part in a lot of tasks, challenges, and the accolades, the encouragement she got...the love she got without being judged... gave her life the much-needed boost. "I kept writing and the response I was getting back from SHEROES was making me work harder. I received a lot of love and encouragement and support. Each one of them helped me and kept motivating me to do better. And today, I am in the process of having my own blog, I have written a few articles on some platforms. Also written a short story for a theme based Analogy. Recently I was a part of Wiki-Edithon on Indian Women Cricketers. SHEROES has given me much more than what I asked for. SHEROES gave me my lost confidence. And I can’t thank them enough," chuckled Nandita. Nandita Singh is busy these days, not only penning her heart out, but has also become one of the most-looked-up-to motivators, especially for the Moms Of Kids With Disabilities Community. But then Nandita Singh you don't have a child with a disability, not even in the farthest links in the family. So how come you are so empathetic? Nandita recalls the year of 2013 when she met Dattatreya (Dattu), a young boy who was completely paralyzed. Dattu was in her neighborhood. "He wasn't born like that, he had a head injury and once he woke up from Coma after 3 months, his body was in a vegetative state. He keeps getting seizures, it has been six years like this....but neither he nor his parents have lost hope. The boy is so strong mentally that every time I meet him, he welcomes me with a smile. Dattu taught me the reason to fight back...no matter what life throws at you. And during my journey at SHEROES, when I came across Moms Of Kids With Disabilities Community, I shared Dattu's story there. Every child with a disability and its parent needs just little mental support and lots of love. I am just trying to spread that..." Nandita Singh tells me with a lump in her throat. The feelings are palpable...and mutual. A social activist, a woman with her head-and-heart at the right place...a writer...What more Nandita? She laughs, "Let me rather tell you what I am NOT! I am not a social butterfly. I love to be with myself, spend time thinking and writing. I am even off social media too. I want to be a content writer and a storyteller. My goal is to be a reader's writer. And also I love to sketch in free time...like sketch these dresses...take a look Mahima." She takes a pause, sends me a few images instantly via messenger and adds, "And I love to motivate each soul that is hurt in some or the other manner...I wish to bring him/her back to life, because life is beautiful." So what's her message then, to inspire others? Pat comes the reply," My message is the same that I keep telling my daughter (she is too young to understand it right now, but soon will). Wear your heart on sleeves. You are one in a million. It's OK to let go, but do not let the fire in you die out. Let this fire shine through you and one day it will show you the way ahead! Just be who you are. Rest, everything will fall in place." So that was Nandita Singh from Bengaluru in an exclusive chat with me in our series #MeetTheSheroes. If #HerStory touched your life, don't forget to share and also leave some love for Nandita in the comments column. See you with another such inspiring life soon! You can also choose to follow Nandita on SHEROES. How inspiring!!! I think, most of the ladies can relate to the story and now can get inspired by reading this ..
That's great Nandita. Keep up the good work. Thank you mam for sharing inspiration real story. I am also one of the victims of depression. Wow... Go Nandita. You have surely come a long way... Cheers! Excellent dear! God bless you and your family. You have been amazing in your battle against depression...Kudos to you! Kudos ! You are the inspiration dear! Keep on doing good work! God bless you and your family ! What can an average home maker do to make her life meaningful?